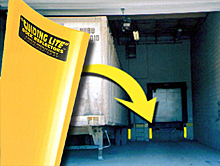 Loading dock reflectors safely guide trucks into your dock, helping truckers avoid collisions with your building or dock. This can help you avoid damage to trailers, your walls, dock, or dock equipment, as well as potential injuries. They reflect sunlight or brake lights to help drivers see the dock edge better, even in low visibility conditions. They don't require electrical power, nor any bulbs to burn out like dock guide lights. Your safe loading dock gets safer and easier to maneuver, and installation takes only a few minutes. When ordering for several dock positions, consider alternating colors between yellow and red or red/white stripes. Doing so will further aid drivers as they back up to the dock. They will be able to see that their dock location has yellow reflectors, whereas the docks on each side have red or red/white reflectors.